While it wasn’t much of a surprise announcement, given the eShop leaks, it seems everyone has been super happy with the release of Fortnite (Free) on the Switch which became immediately available for download after Nintendo’s E3 stream on Tuesday. The Switch version of the game just seems objectively better than the iPad version (which I’ve played tons of) in basically every way. It looks better, it plays better with physical controls, and as a result it seems like the competition is way more intense in matches as well. 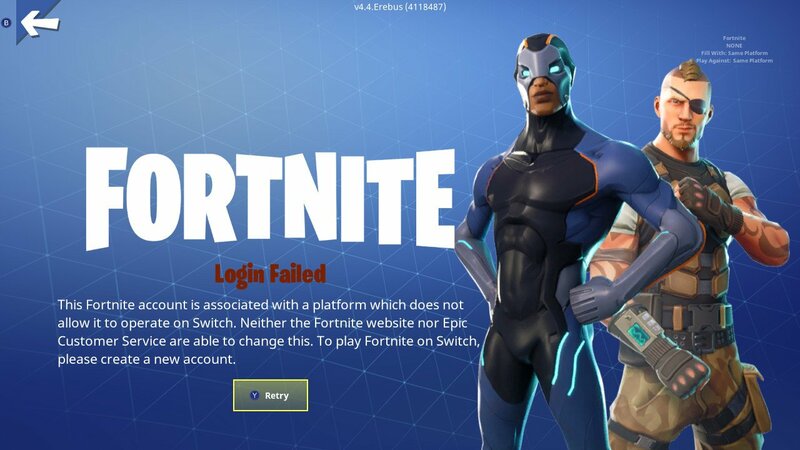 Not everything is awesome in Switch Fortnite Land, however, as it was quickly discovered that if you ever played Fortnite with your Epic account on the PS4, you were completely locked out of using that account on the Switch. Naturally, the internet exploded with massive reddit threads, tons of tweets, often with thousands of retweets, and other outcries that this was completely ridiculous. Really, in the fallout of this whole drama bomb, the only people I could find who actually supported Sony’s decision to lock Epic accounts seemed to be bonafide trolls taking absurd hardline stances on this of the likes I haven’t seen since grade school arguments on the bus about whether Sega or Nintendo was better. Surely this would result in a rapid response from Sony explaining that this is all some oversight and they’re going to quickly either undo the lock or release some method to untie your Epic account from your PS4 account, right? “We’re always open to hearing what the PlayStation community is interested in to enhance their gaming experience. Fortnite is already a huge hit with PS4 fans, offering a true free-to-play experience so gamers can jump in and play online. With 79 million PS4s sold around the world and more than 80 million monthly active users on PlayStation Network, we’ve built a huge community of gamers who can play together on Fortnite and all online titles. We also offer Fortnite cross-play support with PC, Mac, iOS, and Android devices, expanding the opportunity for Fortnite fans on PS4 to play with even more gamers on other platforms." So, basically, the official response so far is “Tons of people have PS4s that you can play Fortnite with, so deal with it." It’s not the approach I would have taken particularly considering they launched the PS4 with the hashtag #4ThePlayers but maybe they’re playing some weird game of 4-D Chess on this and locking people’s Epic accounts because they decided to play on your console makes sense in some weird way. If you thought the drama surrounding all this had hit its peak, and the fire was going to burn out on its own, Sony just decided to dump a whole bucket full of gasoline on it. I’m sort of beside myself by this development, and can’t wait to see what happens next. Without a major shift in direction, I could see people really thinking twice about buying Sony consoles in the future if they are even remotely interested in crossplay capabilities. I definitely am.